Utilizing the vast experience and knowledge and latest technology, we are emerged in supplying a premium range of Air Classifier Mills all over India. Air classifier mills are ideally designed for separating different sizes of particles to micron stage and sub micro stage finally as a powered substances. It is an ideal energy saving equipment by producing material into micro particles with good performance and high efficiency. The direction and speed of a particle is suddenly changed within a fraction of time. This ensures the fine and amp free flowing product. 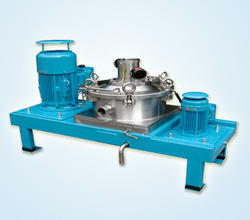 It makes use of centrifugal forces and air currents for separation of substances on the basis of weight of particle. This Air classifiers are applied in following areas like Mineral and other chemical technical products, Material processing, Thermal sensitive, fibrous material. and The salient features which are demanded in the market are Low power consumption and Maintenance, wide range of equipment, capable to handle heat sensitive, made with quality grade material, Minimum handling of product to avoid loss, Excellent performance etc.. Looking for Air Classifier Mills ?